Some performers crave a full stage. Some say three's a crowd. Then there's Random Fractions, a band comprised of a core trio along with whoever happens to come along for the ride. This versatile group of filkers blends genres, instruments, and vibes to create shows that are as fun to experience as they are hard to describe. I'm going to try my best, though. When I heard Cathy McManamon play "Avalon" in a filk circle some seven years ago, I was impressed by her ability to take a fantastical topic and make both the lyrics and melody relatable to anyone, inside or outside the filk community. Her heartfelt drumming, strong guitar-playing, and pleasant alto are enjoyable on their own, but Cathy's gradual infiltration of several filk bands resulted in some really rich musical creations. Formerly known as Three-Fifths but adjusted for their frequent permutations, Random Fractions is the one that most often comes to mind. The above video shows Random Fractions playing "Scarlet Town," their Pegasus Award-nominated song about the Titanic. It's a great showcase of Cathy with the other two core members, Daniel Gunderson (Gundo to most) and Jason Neerenberg. Gundo's chief musical inspiration is classic rock, and it shows through his Random Fractions contributions. He's a talented musician on a number of instruments, including guitar, electric guitar, keyboard, drums, and things I'm likely not aware of yet. Jason's primary instrument is bass guitar, and he rocks it pretty hard. Though Cathy is the default vocalist, Gundo and Jason can often be found harmonizing along with her, and sometimes take vocal center stage. Let's not forget the reason for the band's name. 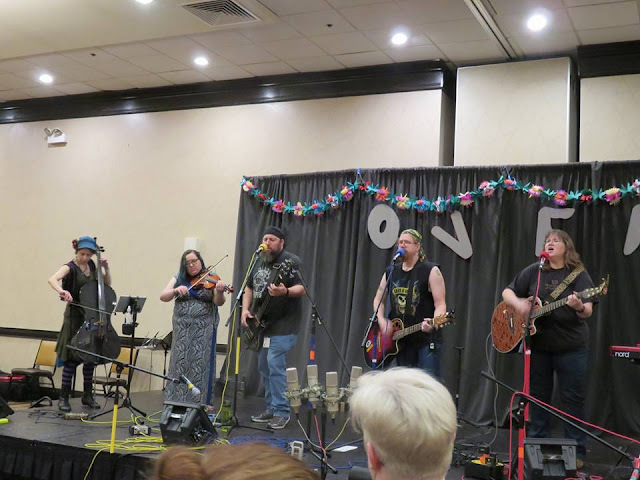 Below is a photo from a Random Fractions concert at the Ohio Valley Filk Festival (OVFF) featuring two common partners in crime who play cello and fiddle. It's difficult to pin down their music as anything more specific than "awesome." They say a lot with few words, telling mystical stories about dragons or simply reminding us of the listeners in our lives. Random Fractions' mix of folk, rock, and whatever else suits their fancy is distinct from most filk bands, borrowing just enough from mainstream music to turn something poignant and introspective into a lively, accessible performance. Along with their original compositions, Random Fractions plays covers of big-time rock and folk stars, as well as songs by other filkers. The latter category includes tunes like SJ Tucker's "Were-owl" and Dave Carter's "Tanglewood Tree." For their beautiful rendition of Carter's song, you can go here. Check out their website for more info, and to see where they're playing next. If you live in Chicago, you're in for a treat, because they play at lots of local events and venues. Go forth and enjoy. What's the best genre-bending song on your playlist? Let us know in the comments! Note: All photos and videos posted with permission of the artists.